Capital Property Solutions allows you to focus on your core business while we serve as your outsourced Facilities Management Department. You have certain standards and goals for your property. CPS delivers the right expertise and resources to meet those goals, with a focus on customer service. We deliver one-call problem solving and 24-hour reliability without the overhead costs, service delays or multiple-call headaches. Contact Capital Property Solutions for a free, friendly, facility review, or for new ideas on facility management and reducing costs. We are a Principal-based company with over 25 years experience in the Columbus and Central Ohio commercial, office and residential facilities management market. Keeping your facility safe and in proper working order is our first priority. Our professional and uniformed associates handle all maintenance, repair and systems service. We work to protect and preserve your facility. 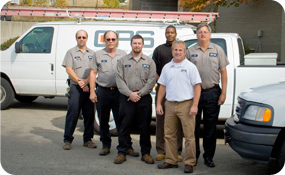 Our senior facility maintenance associates have worked with CPS for over 15 years and take pride in responding promptly and courteously. We work to develop trustworthy relationships with your company’s staff. Honesty and reliability are tenets of our business. Our time-tested network of skilled contractors deliver the best work at the most competitive price. We contract and supervise janitorial, landscaping, window washing, snow removal, pest control, security and access control, build-out, signage and other custom services as required. We serve as the single point of contact for any vendors related to facility management and monitor and report on performance. Contact Capital Property Solutions for a Free, Friendly, Property Review, or for new ideas on facility management and reducing costs. Keeping costs controlled is central to professional facilities management. We’re happy to show you how to reduce costs by outsourcing facilities management services for your office, residential or commercial property in Columbus and Central Ohio. See our Office and Commercial Facilities Management Success Stories and find out why clients trust CPS associates and our expertise. We provide detailed monthly reporting indicating expenses, property inspection and maintenance reports. Daily details are always available at our headquarters office by phone or email. Our headquarters office is staffed with professional associates who answer calls during weekday business hours. For added convenience, we offer online work requests and after–hours contact numbers for 24-hour reliability. What do CPS clients say about our management value, reliability and service?